Innovative games with buckets, broomsticks, etc. Product information "Mehr Spiel & Spaß mit Hund"
This is what you need to make your dog happy: buckets, blankets, drainpipes, boxes, wooden blocks. With the help of these items, you can build amazing toys and come up with endless new combinations. 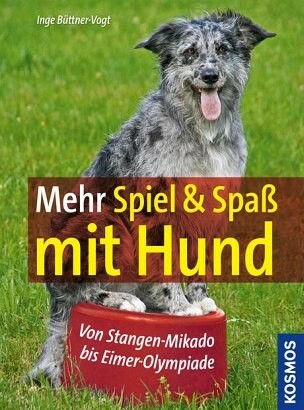 The book includes the best ideas and games for one or more human-dog teams collected by Inge Büttner-Vogt. The best about it: In addition to the fun, your dog will learn something from this book. Along the way and in your company, he will practice to sit still (e.g., in a box), heel during bucket slalom and meet other dogs.